Hector Hugh Munro, best known by his pen-name ‘Saki’, was a true “Edwardian” writer, with a literary career which spanned the period from late 1890s until his death on the Front in 1916. He was born in Burma, raised in England, and travelled throughout Europe with his family to improve his education; not an especially irregular upbringing for middle-class children during the days of the Empire. Munro’s works encapsulate the lingering nostalgic Victorian notions of Empire, not only in terms of the exotic appeal and the yet cultural un-attainability of the colonies, but also of European rivals, particularly the Russian Empire (which projected, for him, a glorious image of Romance and chivalry). He is known predominantly for short satirical stories, offering deliciously scathing commentaries and dark sketches on the superficiality he perceived in the society of his time. Although his sense of alienation and derision pervades his writing, his satire paradoxically projects an underlying fondness for what was, ultimately, a country which he felt a passionate desire to defend from invasion. Whilst academic scholarship is aware of him, the work available is limited, relying too heavily on the rumours of this fairly private man’s life. Brian Gibson’s rigorous monograph deftly acknowledges these rumours and attempts to fill in the gaps left by the lack of primary material, though he is careful not to commit himself where proof is absent or ambiguous. Instead Gibson dissects the evidence of a man, and writer, who attempted to grapple with the ‘fraught complications of sexuality, gender, nation and empire in the Edwardian era’ (2). Importantly, his book also attempts to ‘illuminate the gap between Munro and Saki’ that has not previously been afforded due attention (2). Gibson identifies not a simplistic division between the person and the writer, Munro and Saki, but an obscure overlapping of interdependence, independence and differentiation. As he suggests, the various personas represent ‘a split and doubling that was particularly reflective of the late Victorian and Edwardian eras’ (17). It is perhaps ominous, if not significant, that Munro’s choice of a completely different pen-name, Saki, was assumed at the turn of the century. Gibson does not, however, view this adoption as an inevitable extension of the various experimental personas in Munro’s heterogenic signatures (Hector H. Munro, H.H. 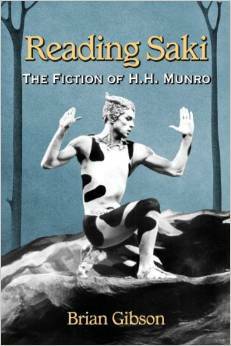 Munro, Hector Hugh Munro) used for earlier projects, but an insight into the complexity of the man. Rather, he asserts, the fairly clear demarcations between the different personas ‘collide and rupture’ as the First World War approaches (19). Gibson takes care, unlike his predecessors, to avoid using the two names interchangeably; not merely because it may be factually incorrect (for instance using Saki to describe works that predate Munro’s adoption of it) but to indicate when there is a clear difference in tone and content. Gibson locates the sardonic Saki, who in the earliest years of the twentieth century was working for various newspapers, within a context of “New Journalism”. This was an amalgamation of serious news and popular entertainment in conjunction with rising literacy levels and a rising demand for print media. Furthermore, Gibson uses the gap between the personas to demonstrate Munro/Saki’s occupation of a liminal literary space; ‘his writing offers a fascinating stylistic break between the usual propriety and semantic laboriousness of Victorian literature and the more fragmented, inner-perspective writing of modernism’ (21). He does not shy away from acknowledging the transparent influences upon the author’s work; most particularly the well-acknowledged inspirations of Oscar Wilde, foremost in style but undoubtedly in personal politics. Yet Gibson recognises the uniqueness of Munro’s style as born out of a particular moment and remaining so because of the writer’s “untimely” death. Due to its brevity, his style perfectly encapsulates the Edwardian moment, but without the hindrance of hindsight and self-reflection of a later career. Indeed, Gibson’s analysis of the influences of the wild isolation of Burma upon Saki’s work is particularly fascinating. These are the aspects most significant in setting the author apart from Wilde, who uses urban environments to invert ‘binaries such as nature : culture or surface : depth’ (63) in contrast to Saki who celebrates nature’s indifference to these simple dichotomies. This is not, to its advantage, a critical edition, nor a complete anthology of Munro/Saki’s works (which remains to be compiled). Although Gibson archives and unpicks the available critical material and creates an inventory of all of the author’s works – short stories, sketches, newspaper features, history books, plays and prose – he only chooses to analyse the pieces which support the particular contextual themes which form the structure of his study; an unconventional “non-heterosexuality”; his position toward women particularly in light of his childhood and the political revolutions; and his depictions of races in relation to “Britishness”. Disappointingly Gibson does not fully develop certain aspects which I feel are contextually relevant, such as Munro/Saki’s depiction of children. Gibson’s perceptive ideas, along with anecdotes such as Munro’s “ruthless tuition” of a good child to be naughty for the day, are consigned to the footnotes. Although he touches upon the utilisation of children in the short stories and considers them in relation to both the author’s own childhood experiences and the prevalent Pan trope of the Edwardian era, the state of childhood and its changes as an institution during the period remain fairly rudimentary. Whilst there is clearly a dearth of primary material, there is not a complete absence and Gibson has, I think, excluded or glossed over some pertinent material. For instance Rothay Reynolds, a friend of Munro’s is mentioned, but not much attention is paid to his biographical note written in September 1918 which offers glimpses as to how others perceived the man and writer, particularly during his role in his final regiment the 22nd Royal Fusiliers. This letter would have been relevant to the notion of homosocial bonding that Gibson sees as prevalent in the writings. More could have been made also of the utilisation of, and connections with, psychoanalytic and psychotherapeutic theories of Munro’s contemporaries, such as Sigmund Freud and Alfred Adler, as both critical and contextual analytic tools. Their confinement to the concluding chapter suggests a non-committal gesture, where Reading Saki may have benefited from a more confident integration of this methodology throughout. One of the great features of the study is undoubtedly Gibson’s transcriptions of Munro’s letters to his publisher which allows for further insight into aspects of the personality of this enigmatic man. Appendicised alongside a single letter from Munro which requests information on how to enlist, Gibson allows space for the reader to analyse the letters in light of Gibson’s depiction of the writer, as well as any other biographical material they may have encountered. The strength of Gibson’s work lies in its ability to untangle the contradictions present in both Munro/Saki’s writing and personal life. Gibson reveals some of Munro/Saki’s most complex contradictions: for instance, although he despised the institution of marriage and its cultural conventions as a means of securing wealth and position, and though he was, if not necessarily homosexual, anti-heteronormative, he vehemently despised the suffragette movement. Furthermore, Gibson depicts a man who glorified the Russian Empire and satirised the politics of his own country in his early works, but whose final novel, When William Came (1913) envisioned a dystopian England in which Germany had won the impending war and ruled England because not enough men had fought for and defended their country. He skilfully draws the connections between these various contradictions in order to map the logical interdependency of these notions. Gibson explains that as a staunch Imperialist, a man raised on a prescription of masculine pride, Munro/Saki could not condone the suggestion that women should have equal rights in everything, for then the “purpose” of men (to protect) would be redundant. Similarly, though he might have admired other cultures within their own setting, to concede power and permit assimilation would be to lose or weaken the strengths of his own race. Gibson suggests that by the time of Munro’s death, the writer professed a strong loyalty to his nation that could not be dampened even by the most appealing aspects of either foreign, or a more liberal, lifestyle. This monograph is an enlightened and thoughtful consideration of the author’s relationship with personal and conventional sexualities in particular, that does not conclude (as nearly all other critical works do), that the distressing instance of Ethel Munro burning her brother’s letters merely confirms or even supports a theory of her brother’s homosexuality. Instead, Gibson refreshingly considers this as just one factor in her recreation of her brother’s character, which suited her own wishes for how she, and the world, would remember Hector Hugh Munro. Ethel was as guilty as later critics in forging an easy image of Saki that matched her needs; recent scholarship has desired, and thus fabricated the figure of a closeted homosexual of sharp wit, the Edwardian Wilde, who was rebellious and unconventional. Gibson wisely and robustly refutes any such pigeon-holing. Munro/Saki remains, to Gibson, a sea of contradictions, floating unapologetically between conformist and aloof, liberal and imperialist, civilised and yet pagan-worshipping. Despite some chaffing and exasperating stylistic concerns, such as the repetition of ideas (often word for word), and some extremely long and confusing sentences, this is an invaluable work that serves those already familiar with the fictions of Munro/Saki very well. It provides an enlightening and insightful analysis of the greater contextual influences that shaped the stories which are often read in isolation in larger anthologies. For the Edwardian enthusiast it may not necessarily offer anything new contextually, but undoubtedly allows them to place Saki within this era, unimpeded by laborious textual analysis. Crucially, this is an essential read for the new Saki scholar, representing an ideal introduction to Saki’s work. It dutifully provides a well-researched literature review and notes on collected works. It educates the unfamiliar in the appropriate manner to approach the author/person divide, but allows room for the literary scholar to discover alternative readings; particularly as many texts are only referred to by title alone. Gibson’s thorough research makes it poignantly clear that there will always be mysteries surrounding the life of Munro/Saki and his short-lived career because so little remains of him outside of his fictions. This is something Gibson laments, but reminds his reader of the responsibility of the academic when reconstructing such mysteries to take account of one’s own intentions and desires. Through solid and intelligent readings what Gibson does do, and delightfully so, is refute the Death of the Author. Jen is pursuing a PhD that considers narratives of the monstrous child before 1960 and is Co Chief Editor of HARTS & Minds, an interdisciplinary journal for postgrads and early career researchers of the arts and humanities. This entry was posted in Reviews and tagged edwardian literature, edwardian short stories, Hector Hugh Munro, Saki. Bookmark the permalink.